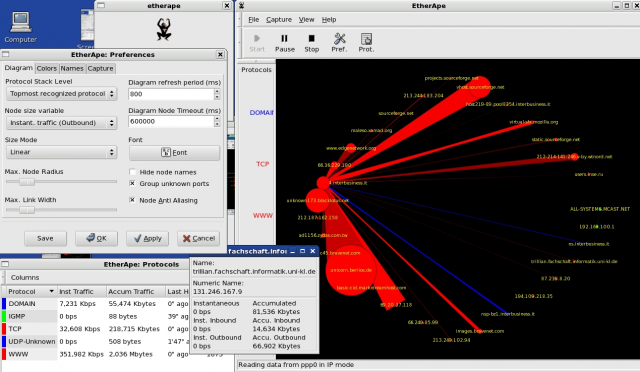 EtherApe is a graphical network monitor for Unix modelled after etherman. Featuring link layer, IP and TCP modes, it displays network activity graphically. Hosts and links change in size with traffic. Colour coded protocols display. It supports Ethernet, FDDI, Token Ring, ISDN, PPP, SLIP and WLAN devices, plus several encapsulation formats. It can filter traffic to be shown and can read packets from a file as well as live from the network. Plug it into the management or span port of your switch and get a real-time graphical flow of what’s going on in your network. The libpcap packet capture library, available from the Lawrence Berkeley National Laboratory. GTK+, available from the GTK+ site. Version 2.12 or above is needed. Gnome, available from the Gnome site. Version 2 is needed.